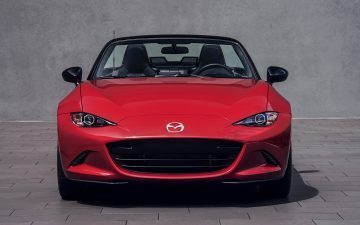 With thousands of models coming from hundreds of automakers over the decades, few cars have followings of enthusiasts the world over quite like the Mazda MX-5 Miata. Whatever you call it—MX-5, Miata, Roadster—it’s hard to argue against its key ingredient: Fun. It’s more fun than any vehicle has a right to be, and it’s a testament design and engineering coming together for the purpose of delighting emotions over rationalizing sensibilities. 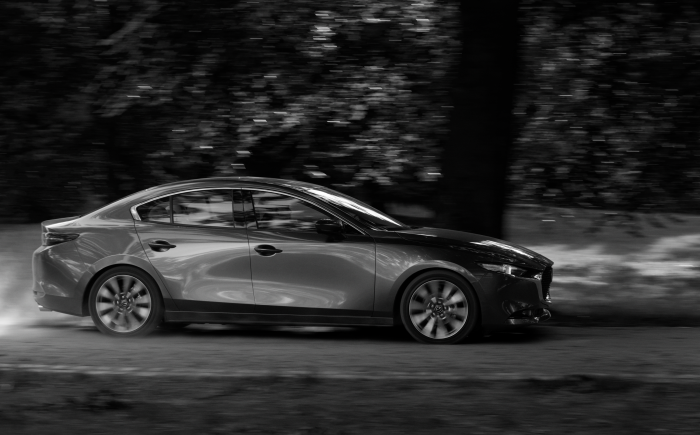 When it won the 2016 World Car of the Year award in a year when nearly every keynote speech at the banquet mentioned autonomous driving, it proved its mettle and lasting significance, winning the hearts of some of the world’s most detail-oriented automotive media. Perhaps that’s why, each year, hundreds of MX-5 enthusiasts from all over the U.S. and Canada—as well as a handful from farther reaches around the world—come to Monterey, California, for Miatas at Mazda Raceway, a gathering of gearheads, enthusiasts, longtime owners, new enthusiasts and friends. The annual October event drew in more than 900 attendees this year who brought more than 700 MX-5s. Mazda chipped in on the action as well, bringing the one-millionth MX-5 Miata to its final official stop of the 18-stop national “Millionth Miata Celebration Tour” and one of the few 2017 MX-5 RFs in the country. The two fourth-generation MX-5s led a parade of 296 cars around the 2.238-mile racetrack for one of the few times the one-millionth MX-5 has been driven. Behind the wheel of the one-millionth MX-5was Road & Track journalist Sam Smith alongside Tom Matano, who served as VP of Mazda’s Irvine-based design operations in the 1980s and ‘90s, overseeing the first-generation MX-5. Matano’s presence was treated like royalty among the sea of MX-5 owners, young and old. He and his wife perused the vendor displays and weaved in and out of the hundreds of cars parked in the Raceway paddock, both dressed in matching black MX-5 hooded sweatshirts. The cars they saw ranged from original-condition roadsters to modified Miatas with high-horsepower V8 engines shoehorned under their hoods to cars that barely looked like the cars on which they were based. Some used MX-5 underpinnings wit fiberglass tubs—because 2,100-pound sports cars are apparently too heavy. Radical—and radically lightweight—and renamed the Catfish. Another, designed by Exomotive and built by the Mad Hatters at Flyin’ Miata out of Colorado, was pared down to just tubing and an engine around MX-5 parts, coming in at just 1,500 lbs. Other cars were stripped-down racecars used in competition throughout the country. 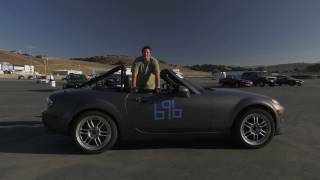 Weldon, an endurance racer, entrepreneur and driving instructor, took the project of getting MX-5 enthusiasts from around North America to come to California’s Central Coast for what amounts to Woodstock-meets-Miatas because he simply loves the car and all it represents: lightweight and fun to drive, heightening the sensation of driving. Miatas at Mazda Raceway is a weekend of comradery, friendship and love for a little roadster that has shaped an industry of sports cars around its 27 years of existence and continues to challenge the industry to hold onto the spirit of joy one can get from behind the wheel.